Xoloitzcuintli (pronounced sholo-its-quintli) means 'dog of the god Xolotl'. In ancient times this breed's primary function was a source of food for its tribesmen. It was also believed to be a healer, pressing the dog's naked body to an ache or sore was said to draw out the pain. They were also considered a sacred animal, it was believed they were needed to help the deceased travel safely to the underworld. The Aztec myth is that the God Xolotl made the Xoloitzcuintli from a sliver of the Bone of Life from which man himself was made. Xolotl gave them as a gift, with the instructions to guard them with their life and in exchange the dog would guide them through the world of death, towards the Evening Star in the Heavens. 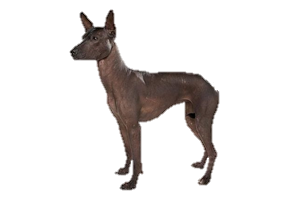 The Xoloitzcuintli is thought to have been native to Central America since Pre-Columbian times and may date back for more than 3500 years. Their ancestry is unknown and many have tried to irrationally link them to other hairless breeds coming from Africa or Asia, however there is no evidence suggesting how these dogs would have arrived in the Americas. We know from ancient artifacts that the extinct Colima Dog from western Mexico had been present long before the arrival of Europeans. It seems far more likely that the hairless gene has appeared in different parts of the world at different times. For example, the American Hairless Terrier, which appeared in a litter of fully coated Rat Terriers in the 1970s. Is the Xoloitzcuintli Right for You?